If you are itching to take your grill for a spin, prepare these quick and easy teriyaki tofu kebabs. 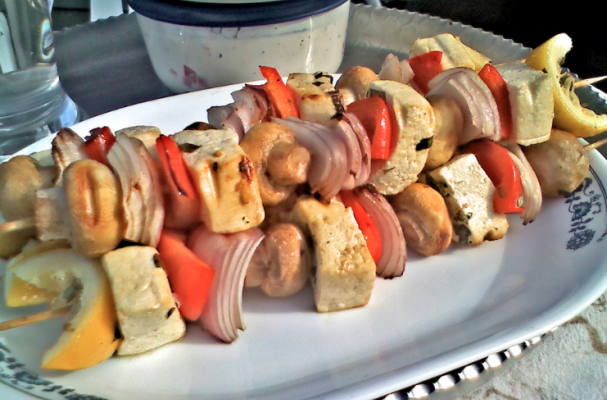 Cubes of tofu are skewered with pineapple and red bell peppers before they are dipped into a homemade teriyaki sauce. It should be noted that this sauce is not overwhelmingly sweet. It has sweet, savory and tart notes from all the ingredients used. Serve these tropically inspired kebabs on a bed of brown rice. Step 1: Preheat your indoor or outdoor grill. Step 2: Alternately thread cubed tofu, pineapple, and peppers on wooden skewers; set aside. Step 3: In a small bowl combine vinegar, canola oil, soy sauce, teriyaki sauce, sesame oil and water. Whisk ingredients until thoroughly combined. Reserve 1/8 cup of the marinade and set the set aside. Brush the remaining marinade over kabobs. Step 4: Reduce the heat on the grill to a medium. Grill the kebabs for 7 to 10 minutes, or until the vegetables are tender and tofu is charred, turning once halfway through grilling. Step 5: Remove kabobs from grill and transfer to a serving plate. Drizzle the reserved marinade over the kabobs and serve. *Note: Soak the wooden skewers for at least an hour before putting them on the grill. We would not want them to catch on fire while the food is cooking.